Times Square got its start when it was transformed from Long Acre (basically a horse exchange) to a center of journalism and entertainment at the turn of the last century. The New York Times opened what was then a dominating skyscraper at the southern end of the spot, and the city thanked them by renaming the area. With the advent of the subways, restaurants, bars and theatres began to pop up. With all the bright nightlife, the stretch of Broadway that runs through the 4 central blocks of Times Square eventually became known as the Great White Way. And that’s where the greatness ended. By the 1970’s Times Square became notorious for being part of the underbelly of society (brilliantly shown in the NSFW HBO show The Deuce), a place to be avoided and reviled. The musicals carried on but it is widely acknowledged as the opening of The Lion King, directed by the multi award- winning Julie Taymor in 1997, that started the Times Square revival. Progress has been slow, and locals like to joke how they would rather walk up 10th Avenue than go through Times Square, but the times, they are a changing and Times Square has become a destination hot spot once again. One of the biggest improvements has been its pedestrianization, and the organization of ‘walking’ spaces and ‘performance’ spaces. Theatres, restaurants and shops line the exterior of the space but the center allows you to pause, look around and take pictures, keep on trucking through if you are on the move, or stop and take that all important selfie with Batman or Elmo, without congesting the district (vital at peak tourists times!) You will still spot the odd Naked Cowboy or Des Nudas, but you are also now just as likely to spot art, sculpture, celebrity performances, boutique hotels and eateries, plus the best tacos north of Texas. 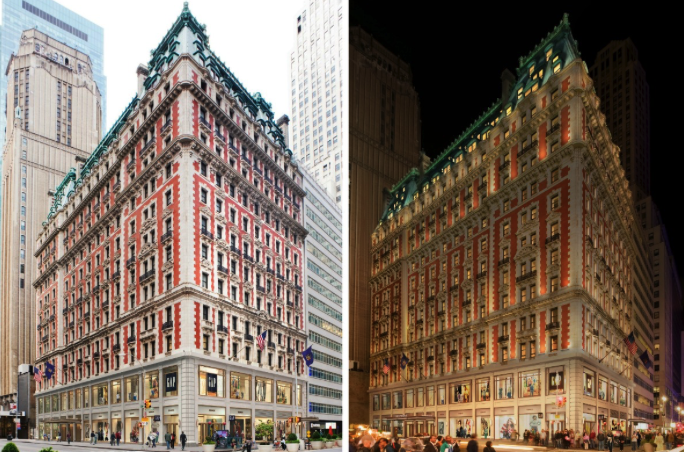 The Knickerbocker Hotel is king of the neighborhood, opened in 1906 by John Jacob Astor, but its rebirth into the first luxury hotel of modern Times Square paved the way for others such as The Chatwal and the Art Deco glamour of the Hotel Edison. The whole world can be eaten in Times Square at places like Sushi by Bou (an underground sushi speakeasy! ), Bugis Street Brasserie (Singapore’s finest), La Pulperia (South American theme with décor from the legendary Red Rooster crew) or the Michelin Star chef headed, Sarr. Of course, you could just rise above it all at the world famous (and revolving!) The View restaurant. The plaza area turns into the hottest ticket in town with FREE live performances most days. Totaling around 30 hours per week, you can see jazz, circus acts, Broadway casts busk, plus classical and world music. Generally starting from between 4-5pm, there are also often noon performances midweek. The Strand bookshop is now involved too, running coloring events from their pop-up wagon, for children big and small. 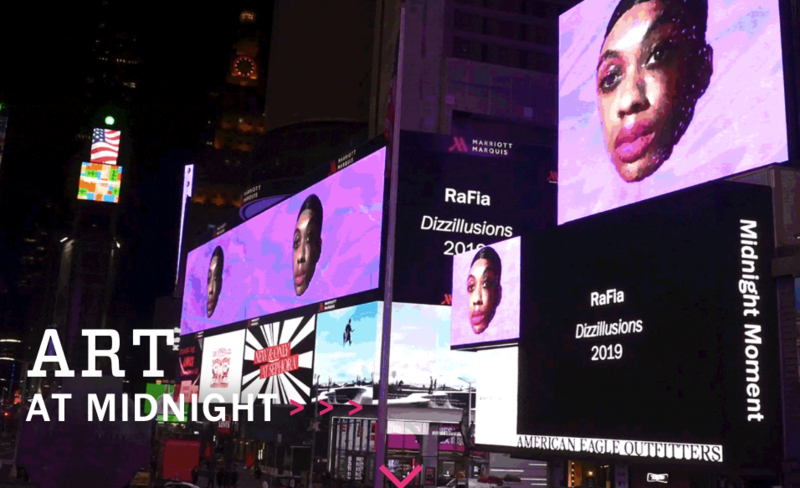 Times Square is FILLED with sculpture that you are often invited to climb and sit on, or art that uses modern technology to interact directly with the surroundings. Teaming up with megastars like Bjork and Marina Abramovic, and local women like RaFia you never know if you will listen to the experiences of immigrants in old telephone booths (as with Once Upon a Place), or feel like the spaces is disappearing around you with MIDNIGHT MOMENTS (at 11.57pm ALL the billboards sinc up for a digital art experience like no other) They even manage to chill it all down to observe the summer solstice on June 21! Not sure where to start! 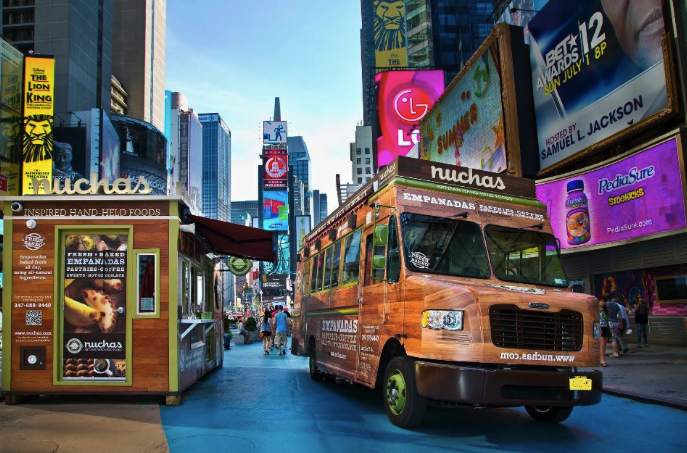 Never fear, Like A Local Tours is here with tours of the Times Square District 4 days a week. It’s a great way to get an introduction to it all and it’s enough food for lunch! Plus get navigation tips, history and architecture. We can also show you how to get those all-important discounted theatre tickets! And don’t miss Los Tacos No 1 on West 43rd (you’re welcome).